In Between the Sunsets of Life: Irrigation & Hello Kitty! One of PV's favorite pairs of shoes are her Hello Kitty rubber boots! She slips them on quite often whether she has on shorts, jeans, or jammies! And on this Saturday morning they were definitely needed! 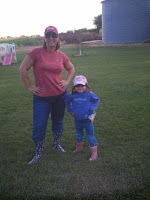 Ready to go in our rubber boots! This past weekend I was fortunate enough to watch my husband teaching our daughter some wonderful tools of the trade in irrigation farming! At four years old she was definitely excited about the "task at hand"! I watched and could not help but smile. She took the "gate closing pole" and got to work! She was quite good I might add! PV is sliding a black rectangle cover over to close off the water so it no longer irrigates the Milo. MV was at the other end opening a certain amount of rows to starting irrigating. They do not run all rows at the same time, there would not be enough water. So it has to be checked at least 2 times per day or more. Normally my father in law does this farm task, so it was a treat for us to get to do it together as a family! One of my dreams for PV is for her to grow up learning the benefit of honest hard work and for her to feel the honor that comes with that. I think it creates a well rounded individual. Farming is a good place to learn that, especially at an early age. To care for the ground and grow something from a small seed, it has amazing results. God has provided us with many blessings, one being that MV can have a career doing something he absolutely loves, and we can raise our daughter in a lifestyle that enhances a person for better things! but in the end you have no regrets for trying! God has provided us with many blessings in the past 10 years and we are thankful for that! I had lots of smiles this weekend, I will share a few photos of why! 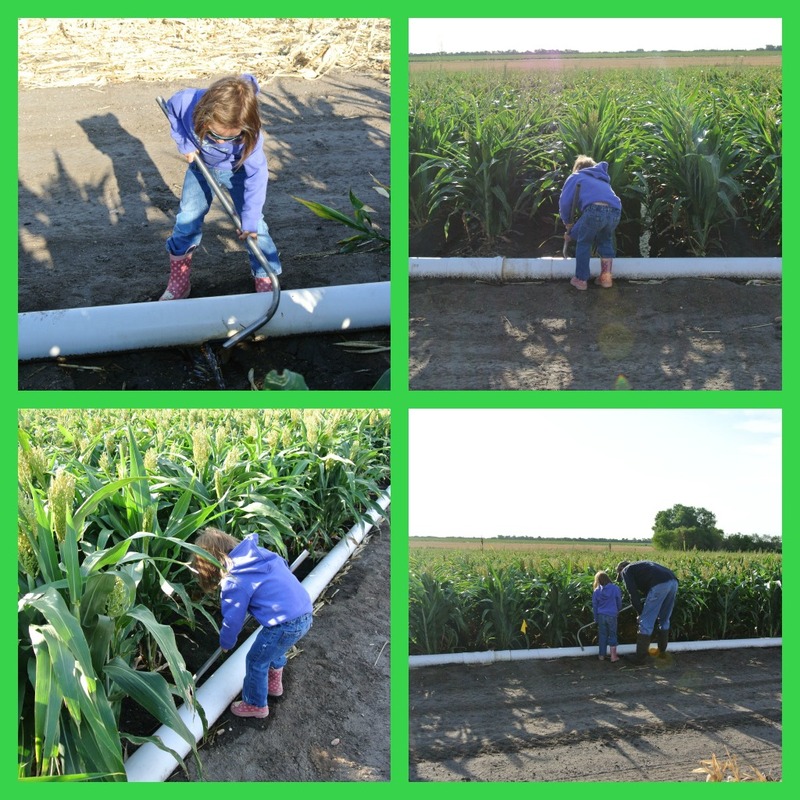 Grain Sorghum field Irrigated, Milton out in the field checking the water level, yes he has rubber boots on but his aren't nearly as cute as PV's Hello Kitty ones! Our family! Just makes my heart warm! PV waiting on us while we open gates and playing in the dirt! Can't be a farm kid without alittle dirt!